Protesters in Bangkok refuse to hold talks with the government unless parliament is dissolved and an election begins. The red shirts support the former Thailand Prime Minister Thaksin Shinawatra who was ousted by a military coup. Thailand Prime Minister Abhisit Vejjajiva is willing to meet protesters to ease tensions. 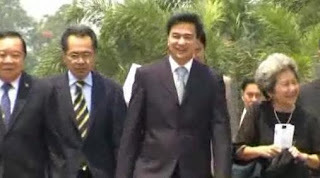 Prime Minister Abhisit Vejjajiva is currently staying at a military base for protection.